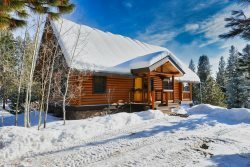 Close proximity to Payette Lake and National Forest. Hollywood Lounge and Bar. Lounge and bar adjacent to the saltwater pool. Indoor, salt water leisure and lap pool with spa. Pool adjacent to lounge and bar. Ice maker, beer and wine cooler and sink at bar. Get your game on - pool, Foosball and table tennis. Game room is adjacent to the bar. One of several lounging decks. Lovely, well established and landscaped acreage in wooded setting. Spacious kitchen is fully stocked with large, island work space. Plenty of room to move around in. Dedicated dining area with large table. Master Suite with king sized bed, walk in closet, and private bath. Master Suite has attached bath with walk-in shower. Walk-in shower with multi-directional shower heads. Guest bedroom 1 with king bed is located on the main level. Guest bathroom on main level. Downstairs guest bedroom 2 with twin over full bunk set. TV room on main level with access to guest bedrooms 3 and 4. both sofas are sofa sleepers Downstairs guest bedroom 3 with twin over full bunk set. Downstairs guest bedroom 4 with queen bed. This is a pass through to bedroom 3. Upstairs guest bedroom 5 with twin over full size bunk with trundle. Upstairs guest bedroom 6 with two twin beds and incredible views. Upstairs guest bedroom 6 with two twin beds is cozy and bright. Living room has large, flat screen TV with Satellite Cozy and charming living room centrally located on main level The Seasons at McCall - Year round destination. The intimacy of a woodland cabin...the amenities of a private mountain resort. Introducing Seasons at McCall. Year round access and year-round activities are primary to this exceptional, fully fenced property. Seasons is the perfect “get away from it all and relax” destination for family gatherings, or a peaceful vacation retreat in a park-like setting in beautiful, mile-high McCall, Idaho. Get out there! Walk to outstanding restaurants, ride a few yards to hook onto the new Bear Basin mountain bike trail system, cruise into charming downtown. No shortage of outdoor opportunity awaits, including Payette Lake just down the lane and Brundage Mountain Resort a short eight miles away. You’ll create your own perfect adventure experience, from biking to boating and hiking to soaking in local hot springs. Of course, an indoor saltwater leisure and lap pool and a hot tub also await you back at your own mountain oasis, Seasons at McCall. After a day of adventure, refresh your soul around a campfire under the stars. Or activate your competitive spirit and start a Foosball, Horseshoe, Ping Pong or Pool tournament. Looking for solace? Relax in a cozy chair out on the nearly two acres of fully landscaped grounds or on any one of several lounging decks. Gather around the full-size bar in a family fun room, equipped with Bluetooth-enabled 75” smart flat screen adjacent to the game room, pool, and spa for easy access. Your group will appreciate the staging and food prep/serve area. An additional home theater with 65” smart TV and wood burning stove is located on the main level. Charming accommodations in this three-level home for up to 19 people in 7 bedrooms and 4 bathrooms (5 bedrooms and two bathrooms on the main level and 2 bedrooms and one bathroom on the upstairs level). Enjoy spacious living and play areas and a fully equipped kitchen with a large, dedicated dining area. Two gas grills are located on the property where you can whip up a great meal as a mountain breeze passes through, and enjoy the private hot tub out on the back deck!!! Seasons at McCall has parking with easy access and turn around. Boaters and Snowmobilers, we’ve got parking for your rigs, trailers and sled decks. This property is wheelchair accessible and has an elevator as well as a ramp to the pool area. Private, indoor saltwater leisure pool and lap pool. Rambling acreage with well established, expansive lawn and landscaping. Plenty of parking for your toy trailers and rigs. Game room with foosball, ping pong, and pool table. Overall a very nice place ! I hope your city meeting went well and you will be able to continue renting out the property. (We saw the public hearing announcement taped to the doors of the garage). First time staying at this property. McCall is one of our top 3 favorite places to vacation! It did not disappoint! Even on the rainy days we had a blast! This property has it all. We will definitely stay here every time we come back! Management was great and the house was clean with comfy beds and lots of fun! Loved it!!! The City of McCall surrounded by Mountains with the natural gem, Payette Lake, at their base allows vacationers countless opportunities to discover and explore the outdoors. Surrounded by the Payette National Forests, visitors enjoy access in all directions. Lake and river fishing, boating, downhill and Nordic skiing, snowmobiling, hiking, biking or soaking at one of several hot springs in the area bring our guests back year after year all year long. Savor an alpine summer sunset from your balcony or deck or lakeside at Legacy Park. You're just minutes from shopping and dining in downtown McCall, a great location for Winter Carnival. If you're a skating enthusiast - Hockey, public skating and McCall Starz on Ice! Venues are just a short drive away at the Manchester Ice & Event Centre.